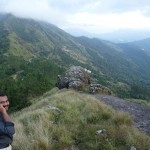 I got a unique chance to climb up Chokra Mudi near the Lockhart gap in Munnar last Wednesday (25 Nov. 2009). Chokra Mudi or Choka Mudi as local tribal people call it is the second highest peak, south of the Palghat pass after Anamudi (Dodabeta is the second highest peak in the whole South India after Anamudi, but it is in the Nilgiris north of the pass). It is a pivotal natural structure having great geological and cultural significance in the history of ancient tribes like Mannans and Muduvans in the Anamalais and Cardamom Hills. Its south slopes in Muttukad hosts megalithic dolmens and rock-cut caves. Its western lower reaches still retain place names like Mannan Kandam now known as Adimaly. 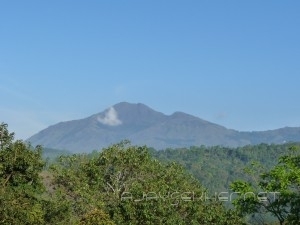 It is visible from Adimali, Vellathooval, Ponmudi, Rajakad, Rajakumari and Bison Valley. This magnificent rock peak towers well above 2400 Mts. above sea level. My friends Kannan, Rajesh, Vinod and Unni from Rajakumari were not much interested in birding but were really enthused in rock-climbing and hiking. 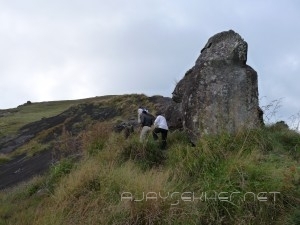 The craggy and steep terrain was a real challenge for them who were mostly raised in the high ranges. I followed far behind them and could manage to see a few birds as well. Plenty of House Swifts and Dusky Crag Martins were seen in agile fast motion overhead. A few Alpine Swifts were also seen. In a grass patch a pair of Pipits were found, but did not get any shots and there fore could not identify them. A few Stone Chats were also seen around. Grey wagtails are abundant in the lower areas of the mighty peak constantly drenched by tiny springs and cataracts. In the foundation we can see unique flora mixed up with the grassland and rocky terrain. After an hour of climbing we reached the half way mark and began to rest. Unfortunately this unique natural and geographical heritage of the Western Ghats is illegally colonized by a dominant religious group and some religious marks and icons adorn the rocks and the peak! We can see the whole northern Idukki district from here. From Bodimettu to Adimali is visible. 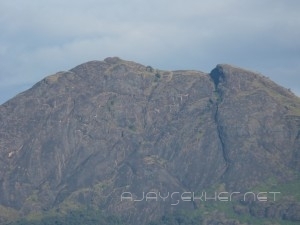 This immense rock projection offers a panoramic view of Bison Valley, Rajakkad, Pallivasal, Rajakumari, Santhanpara and Muttukad areas down below. As we were enjoying this breathtaking sight I heard a distant “Klee – klee – klee…” from far above! It was repeated in short intervals. 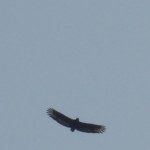 Yes, it was a Crested Serpent Eagle above Choka Mudi! It was soaring well above the pinnacle. To add to our amazement we saw another one near the first bird. They were hovering above in tandem! The circling motion of the Eagle couple was a moving sight at that location, that even attracted my friends who were not so keen on birds. As we watched curiously the huge birds of prey slowly moved towards the shola grasslands adjoining the Muttukad plantations. After one more hour of hard and painstaking ascend we finally reached the summit. It was fortunately cleared of mist. Normally we see the pinnacle always covered with heavy fog and clouds. This time we saw clouds sailing well below us! It was a magical experience, though tiring. And without wasting time we began our down hill task which was more risky and dangerous. We managed to get down to the National Highway 49 near the gap-road as the dusk was engulfing the whole landscape. the sight of the Serpent Eagles in elevated flight and their repeated calls and responses are still simply unforgettable. This entry was posted in Culture and Ecology and tagged ajay sekher, Alpine swift, Bison Valley, Cardamom Hills, Choka Mudi, Chokra Mudi, Crested Serpent Eagle, Gap Road, Grey wagtail, Lockhart Gap, Mannan, Muduvan, Munnar, Muttukad, Trecking Anamalis on November 29, 2009 by Ajay. hi Koy, go ahead and quote! hi , is it possible to camp at the top of the peek?